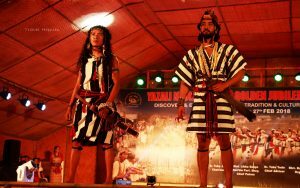 My first encounter and an impression of the Nyishis, one of the major tribes of Arunachal Pradesh in India, was that of a jolly natured people who dressed like ancient Greeks. And their adaptation of modern fashion stunned me even more. The grand celebration of 50th Nyokum Yullo Festival ( festival for better productivity, prosperity and happiness of all human beings on earth) at Yazali brought me closer to the unbelievable fashion sense and creativity of this tribe. The striking part was that each model showed the indigenous sense of the tribe to utilize the natural objects that almost nullifies the garbage. 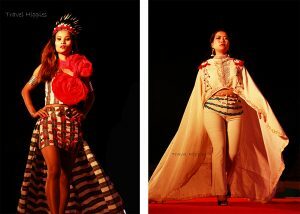 Famous designers of the state came together to blend the tribe’s early style with the spices of current fashion trends. 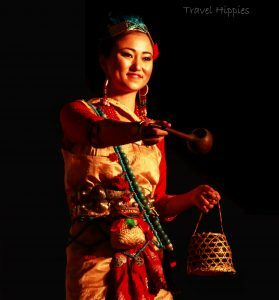 From the fabric to bamboo accessories and Hornbill beak headgears to Eagle clawed hairstyle, Nyishis know how to flaunt it all during the grand celebration of the Nyokum Yullo Festival. Men and women have the same wrapping attire called ‘Par Eij‘ which is usually worn during the auspicious occasions and celebrations. Thus, during the Nyokum Yullo Festival, you would see most of the people involved in the rituals wearing the same yellowish white (macaroon shade) attires in different styles. 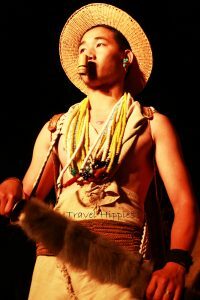 The men wear a number of stone bead necklaces or ‘Tesee‘ called ‘Domin‘ bunched together and also carry a sword, a spear or a bow with a number of arrows in a bamboo backpack called ‘Nara‘. While a rope is tucked on this backpack just for the decorative purpose, it was used for the climbing and crossing purpose in the earlier times. A few people also wear a black cloak made out of a Sago Palm tree’s blade-like skin. It is cut, dried and then tied together in order to make the furry coat which is known as ‘Tassh Nara’. Another cotton fabric used by the tribe is a designed with black and white stripes commonly introduced as Zebra dress and locally known as ‘Pomo‘. It is accompanied by a belt called ‘Tama‘. The genius ancestors very well knew the use of the commonly found wild creeper. It is dried off and is used for various purposes. The attire for man is always short considering their ventures and hunting expedition. As their legs and hands are bare, they created a few ornaments for that too. Created by peeling bamboo, the strips are braided to create the ‘Lalum’ that can be seen in the above picture. The men wear it below the knees while women wear it on ankles. The third dress of the Nyishis consist of the plain jade-black fabric and is locally known as Jekh Eij. Loaded with multiple bead necklaces mostly shaded emerald green, white and tiny red pearls, the Nyishi ladies ooze grace and charm in the shades of bright red and pale coffee. Most of the time, pom-poms made of red or white wool are also used to embellish the jewelry, clothes or headgear. The women’s bead necklace is called ‘Seetir‘. 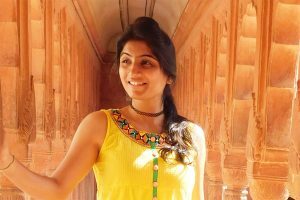 While ‘Tama‘ accessorizes the dress of men, women have created a more beautiful version of the same by looping it with ‘Hupiya‘, small metal disks. However, it is tied over a bright red scarf that is wrapped around their waist. Further, Reign, Tajin and Juhwe , a dangling on their waist make the attire all the more gorgeous. ‘Chucha‘ a small basket, which was probably a pocket or a wallet for the Nyishi ladies is tucked in the Hupiya. The bracelet and earrings are usually made of the shining metal. While the earrings of women are usually made of metal, the men wear only one earring studded with semi-precious emerald stones. The buoyant face with the neatly tied hair is festooned with a heavy metal chaplet or ‘Dumpins‘ threaded with blue beads that rest on their head like a tiara. As per a marriage custom of the Nyishis, the bridegroom’s family gifts a number of Mithuns (Indian gaur or bison) as a gesture of asking the bride’s hand from her family or as a gesture of fixing the marriage. 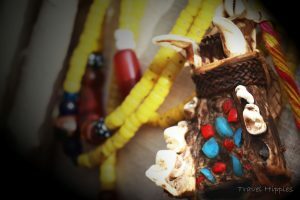 In another custom when the bride’s family comes to the groom’s house, they gift precious artefacts and necklaces of beads usually found in the Himalayas. The cost of these precious jewels varies from 3000 INR to 8 Lakh INR. The gift is given based on the financial capabilities of the family. 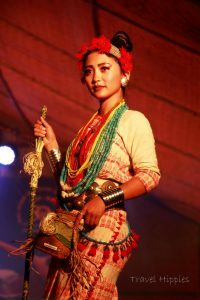 Surprisingly, gold jewelry is not in trend even till now and probably, the gold doesn’t even hold much cultural value for the tribes of North East India. This is how a ceremonial couple looks like. The girls either wear a plain cloth or a draping with red designs. Many a time, the plain cloth is also decorated with woolen pom-poms. 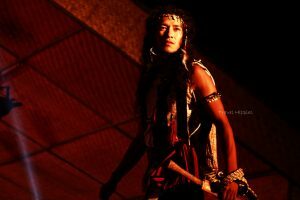 Another distinctive accessory worn by a Nyishi man is the sword called ‘Dao‘. The handle is embellished with the locally found shells and the bamboo case if further coated with the fur of a monkey or a bear. The man and women also carry a chillum called ‘Seile‘ and what do they smoke? No, tobacco and weed aren’t their stuff. They smoke the dried ‘Kele‘ leaves found in the forests of Arunachal. This shows how Nyishi people could recognize the peculiarity and usage of every available plant. This was probably the highlight of the show where a designer had showcased the western versions of Par Eij and Pomo. 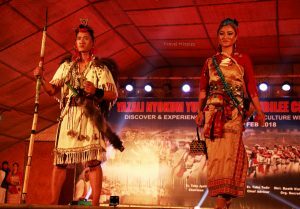 The young generation, including us, were all stunned looking at the way these tribal girls carried the Trench version of their dress. And probably, this was the move to keep the conventional clothing alive while embracing the westernized styling. In a way, it is only a revolutionary change in the traditional dressing. The common headgear was worn as a fanciful tiara and the hues were also slickly used to give the ethnic touch to these modern attires. This fellow in the picture has literally nailed the fierce look of the Nyishis. Once upon a time, the Nyishi men had long hair that was either left open or was tied in a bun above their forehead very much like the Sikhs of Punjab. The bun is then covered with the layers of yellow woollen threads giving it a look of a headgear. 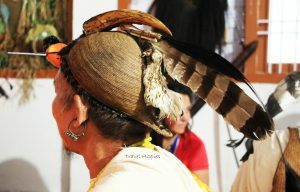 Their traditional headgear ‘Bopiya’ was also tied along with it to prevent it from falling off during any sporty movement. These are not the traditional ways of draping the ‘Pomo‘ or the ‘Par Eij‘, but again being on a track with the current world, the clothing, as well as all the accessories of the tribe, are donned in the best possible way. Apart from carrying the small basket, the Nyishi women generally have a big basket held on their back over the head. It is called ‘Egin‘ or ‘Tokkri‘ which is used to carry grains from the fields, firewood and sometimes even water. 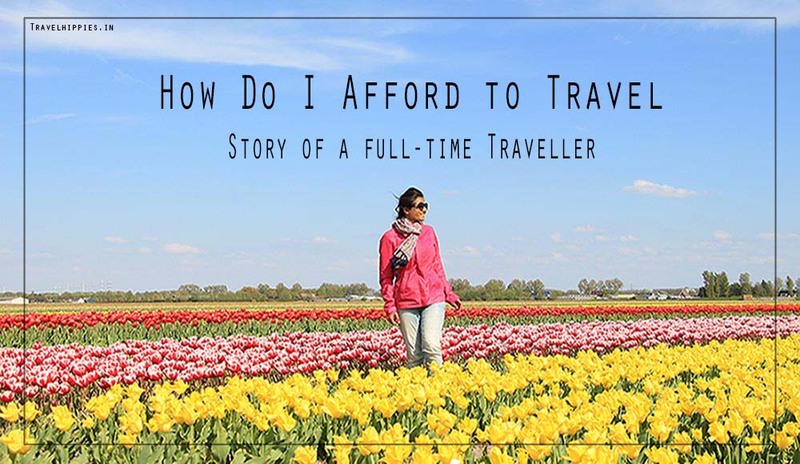 While traveling in the area, I saw many girls and ladies carrying the same and actually using it for their daily purpose. Probably, this is their way of not polluting their river and air with harmful chemicals released by the fancy bag making factories. 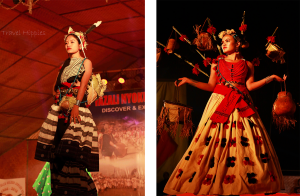 While the theme of the Yazali Nyokum emphasized on the organic living, these models just promoted it in a way that can impress the young generation. Both men and women also carry ‘Patha‘ a small goblet made by drilling out the bamboo shoots which are used to drink local millet beer named Apong or Opo and even water. The ladies, especially during the festival, would be seen carrying a hollow bottle-shaped container called ‘Harcha‘. The main use of it is to serve the local brew. It is made by scooping out the local bottle gourd which is then dried off, chiseled from within and polished to give it a beautiful look. Almost all the Nyishi Houses would be having a number of ‘Harchas‘ hanged on the wall of their houses. During the time of festival or any auspicious occasion, these Harchas are decorated with green leaves ‘Kohaam Okhh’, bamboo pom-poms, and the white rice flour. The rice-flour is used the way ‘kumkum’ is used in the other parts of India. The girls apply it on their cheeks, it is sprinkled over people as an auspicious powder and even applied on the things to be used in rituals. The larger bottle gourds are converted into storage containers which are generally stationed at home for the keeping of Apong or drinking water. It is called Oppum. Even the ladle is made out of a small bottle gourd and it is called Oju. Considering the increasing population and the demand against the low availability and production of the bottle gourds has made such containers become a little expensive and costs around 400-800 INR in the local market. The Nyishis have been the most creative with their headgears called ‘Bopiya‘. Unfortunately, with the changing times, only bamboo hats are prevailing the most among the Nyishis, Bopiyas were their traditional headgears helping them stand out among the other tribes. Though the headgears are quite in use by the elder members of the tribe in the villages, the current generation adorns it on their heads only during the festivals. I chanced upon a few very interesting hats during the Yazali Nyokum Yullo Festival. A Hornbill beak with a real eagle’s head tucked in front and a claw at the back; and sometimes, a tail of a monkey comes as a surprising element while curiously observing all of them. I sheepishly kept asking almost all of them if it was real. I would get a few ‘Yes’ for a few bizarre animal parts but most of the hornbill beaks were just the wooden representation. If you observe this picture carefully, everything in this Shaman’s headgear is real. A real hornbill’s beak, feathers of a few birds, a claw, and even the hair braided to form the knot in the front. “Erstwhile, we could spot too many hornbills and we killed them for our headgears, but now there are endangered and gradually the awareness is spreading. We are now working towards preserving these beautiful birds of the mountain, so we choose a wooden beak,” said a local when questioned for not fixing a real beak in their headgear. No wonder the headgear costs thousands as a number of animals have to be killed to prepare just one original headgear. And currently, as the tribe has gained consciousness of the endangered animals, they have shifted to the substitutes of these parts that are made of natural components. An ancestral tiger jaw worn as a pendant by a Nyishi Man. 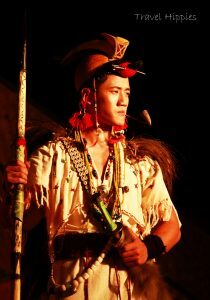 A nail of a tiger, teeth or the eagle’s beak are common pendants that you can spot on Nyishi men. However, the Nyishis feel proud to be covered by the animals, plants and Himalayan stones from head to toe as this represents their love for nature and their harmony with their surrounding!! ← Bhedaghat: A Gorge that would make you Fall……..